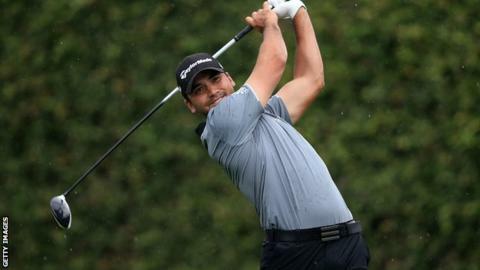 Australia's Jason Day leads by two shots with England's Justin Rose still in contention after three rounds of the Arnold Palmer Invitational at Bay Hill. US PGA champion Day struggled on the greens but his two-under 70 moved him to 15 under in Orlando. Americans Kevin Chappell and playing partner Troy Merritt hit the best scores of the day with 67s to be joint second with Denmark's Henrik Stenson. Rose is two strokes further back after a one-under 71 in wet conditions. Northern Ireland's Rory McIlroy continued to struggle and shot a three-over 75 to trail the leader by 16 shots, as tee-times were moved forward to avoid thunderstorms that were forecast for the afternoon. Day started sluggishly with a bogey at the second, but posted three birdies before the turn and dealt well with the worst of the weather coming home, cancelling out a bogey on the 11th with a super putt at the 16th. The 28-year-old told Sky Sports: "It was a tough old day with a lot of rain, the wind changing direction and temperature changes. It cost me shots, but, for the most part, I'm very pleased. "I think the weather will be similar tomorrow, so it will be another day of grinding it out and being as patient as possible." Rose will feel relieved that he is still in contention going into the final round after a round in which his putter frequently let him down. In particular he was left to rue a short par putt at the 17th that slid past the rim. McIlroy continues his wait for a first victory in 2016 as he struggled to a three-over 75 to trail the leader by 16 shots. After starting from the 10th due to an early two-tee start in anticipation of the bad weather, the world number two made birdies on the 11th and 16th to reach four under par. However, McIlroy's approach to the 18th then landed in the rocks on the edge of a water hazard and led to a double-bogey six, which was soon followed by another on the third, where he found water off the tee and with his attempted recovery. England's Paul Casey finished with back-to-back bogeys for a third-round 72 to remain in the hunt for a top-10 finish. Commenting on his round, the world number 26 said: "Frustrated but happy at the same time."